Sudden Environmental Change or Sudden Environmental Contrast or "SEC is a change in surroundings that happens quickly, like a child suddenly coming around a corner, a dog suddenly appearing out of a car, or a guest standing up to leave the house. For some dogs the appearance of a trash bin in a different place than yesterday's walk can stress [dogs} out." To help dogs feel better about SEC, pet parents can use Control Unleashed or simple counter conditioning and desensitization or the Relaxation Protocol. 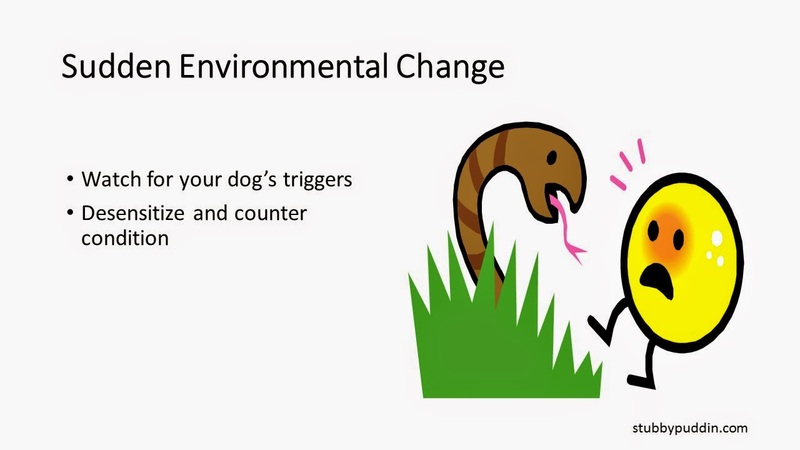 The most important thing is to stay below threshold and increase the intensity of the trigger in teeny tiny increments so the dog doesn't get upset. Example. Your nervous pet is okay with the man of the house sitting still, but gets upset when said man stands up. Here is one way to work on that. -Man moves a pinky, Mom gives the dog a treat. Note that treats should always come from the person who does not scare the dog. See more treats here. - Man sits back down - enough for one day. Let's say a dog is afraid of strangers suddenly appearing. We can start by working with a non scary friend or family member. Have friend slowly appear from behind a building while dog is 50 feet away, treat. Once pup is fine with friend moving about, then work with a well coached stranger who is much further away - and so on. Note that pet parents shouldn't always continuously make the exercises more difficult. Sometimes guardians should decrease the stimulation. For example - work 50 feet away, then 40 feet, then 80 feet, then 50 feet, then 30 feet, then 95 feet and so on. The main thing is to keep the dog comfortable. Look for calming signals. Helping dogs with simple SEC exercises can prepare them for more difficult challenges - like squirrel chasing.